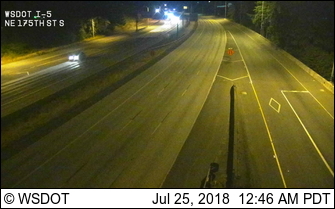 People who use southbound Interstate 5 in Shoreline should prepare for traffic delays starting at 6:30pm Thursday, July 26. All work is expected to wrap up by 5am Friday, July 27, 2018. Washington State Department of Transportation maintenance crews need to close lanes and ramps on southbound I-5 near North 175th St in order to safely demolish a broken concrete panel. During the closure, crews will use two excavators to bust up the broken panel before laying down new asphalt onto the roadway. The right lane of southbound I-5 at N 175th St will be closed. A second lane will close at 8pm. The N 175th St on-ramp to southbound I-5 will be closed. The southbound I-5 transit only off-ramp to the Metro bus barn will be closed. In the King County area, drivers can get real-time traffic information on their phone with the WSDOT traffic app, following the WSDOT traffic Twitter feed and get advanced information from the King County Construction page.